Iain Sinclair’s 40 year obsession with the Limehouse pyramid started with ‘Lud Heat’ in 1975 and continued right up his most recent book, ‘The Last London’ in 2017. 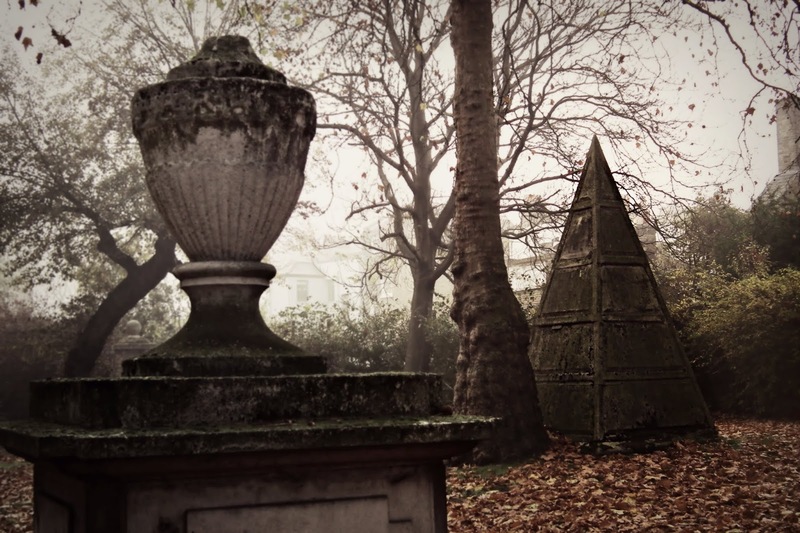 All his writings between are littered with references to the pyramid in the churchyard of St Anne’s including ‘Light’s Out For the Territory’, ‘Liquid City’ (which includes an excellent Marc Atkins photo of it) and ‘Ghost Milk’. In ‘Lud Heat’ he sets out the theory that 8 churches built by Nicolas Hawksmoor along with a number of obelisks and pyramids (St Anne’s foremost amongst them) dotted around east London form a sacred geometry of power lines in the shape of an ancient Egyptian Hieroglyph; “Eight churches give us the enclosure, the shape of fear; ... erected over a fen of undisclosed horrors, white stones laid upon the mud and dust". 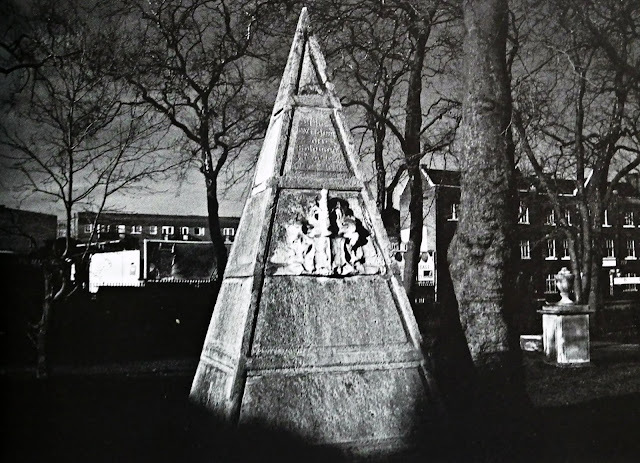 This ‘enclosure’ covers the ancient city and its Roman temples dedicated to Mithras, its plague pits and cemeteries, its prisons and places of execution and the scenes of its most notorious crimes, the Ratcliffe Highway Murders of 1811 and the Whitechapel murders, the Jack the Ripper killings, of 1888. Peter Ackroyd later exploited Sinclair’s outré theory to much greater commercial effect in ‘Hawksmoor’ and Sinclair never seems to have got over the shock of seeing Peter Ackroyd and Melvyn Bragg resplendent in pinstripe suits, posing in front of the Limehouse pyramid on the South Bank Show and discussing Ackroyd’s stratospheric sales figures and his critical and popular acclaim (he was more forgiving though of his friend Alan Moore’s use of the Hawksmoor black legend in ‘From Hell’). 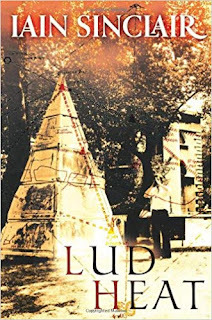 The St Anne’s pyramid features on at least two cover designs for ‘Lud Heat’. Despite all the portentous omphalos symbolism invested in the pyramid I had always assumed that it was merely a standard monument, a hyper inflated grave marker, and that it would carry an inscription recording whose memorial it was. Not untypically of churchyard and cemetery pyramids it even has a coat of arms complete with what looks like a unicorn; high social status goes hand in hand with being buried inside or beneath pyramids, from the pharaohs of ancient Egypt to the landed gentry of the 18th century and the haut bourgeoisie of Victorian England . But the only inscription, engraved above the armorial crest, are the mysterious words ‘The Wisdom of Solomon’. Some accounts claim these were once also carved in Hebrew characters further down the pyramid and many see all this as evidence that it is somehow linked to the Masons. The pyramid is built of Portland Stone and in pristine condition would have been almost white, like St Anne’s itself, but it is now weathered and covered in a velvety layer of dark green moss. Whatever the pyramid is, it is not a memorial. It doesn’t seem likely to be a secret masonic symbol either. 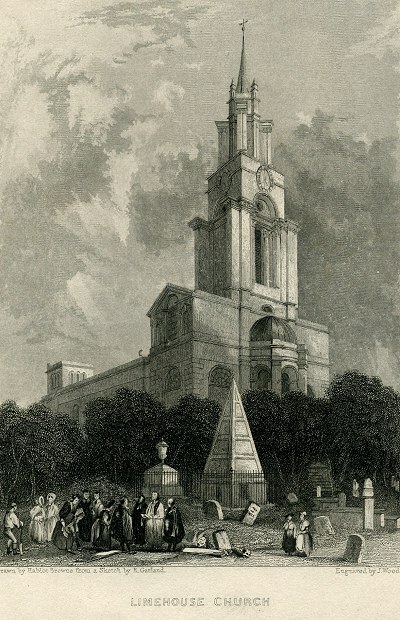 Most commentators think the pyramid was part of Hawksmoor’s original design for St Anne’s and was perhaps intended to top the tower. It isn’t really big enough to cap the tower but possibly it was meant to be set up on some other part of the building. Hawksmoor certainly liked to idiosyncratically incorporate eclectic classical elements into his buildings, the portico based on the Temple of Dionysus at Baalbeck and the stepped tower of St George’s in Bloomsbury and the six copies of a Roman sacrificial altar that top the tower of St George’s in the East are examples. And he liked pyramids – he designed and built one at Castle Howard for the Earl of Carlisle in 1728, the year after work was finished at St Anne’s. It does seem likely then that the pyramid was made for Hawksmoor for use as an architectural feature but that he then had second thoughts and with no where better to put it, it ended up in the churchyard. 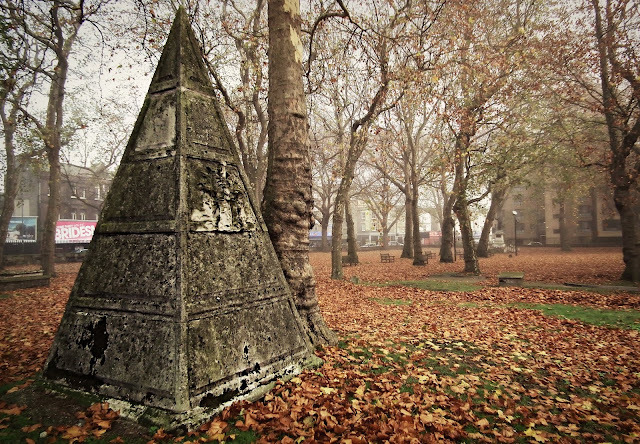 The pyramid as photographed by Marc Atkins for 'Liquid City'. Nothing could be more complete than the destruction of the interior fittings of the church. The oak pews and gallery were entirely consumed; the organ stood for some time, until the pipes were gradually melted by the intense heat. The altar windows, of painted glass, representing the Sermon on the Mount, was soon destroyed; as were all the monuments and hatchments upon the walls, except tablet to the memory of a lady named Blyth: this memorial, to the left of the altar, was but slightly injured. When the body of the Church took fire, the flames speedily communicated through the organ loft with the belfry the woodwork in which having been consumed, the bells, one of which is of very large size, fell through, and was only prevented from reaching the ground by a very strong stone arch beneath the bell-tower….The galleries are destroyed, scarcely a mark of their former existence being discernible; and, notwithstanding the remains of the roof, galleries, and pews are all contained within the four walls, the mass of rubbish scarcely rises couple of feet above the floor of the Church. The two beams forming the support of the pulpit are almost the only pieces of timber left in an erect position, and these are charred by the fire that a touch would crumble them. The six magnificent pillars supporting the roof—three on each side—are reduced to shapeless masses of calcined stone. 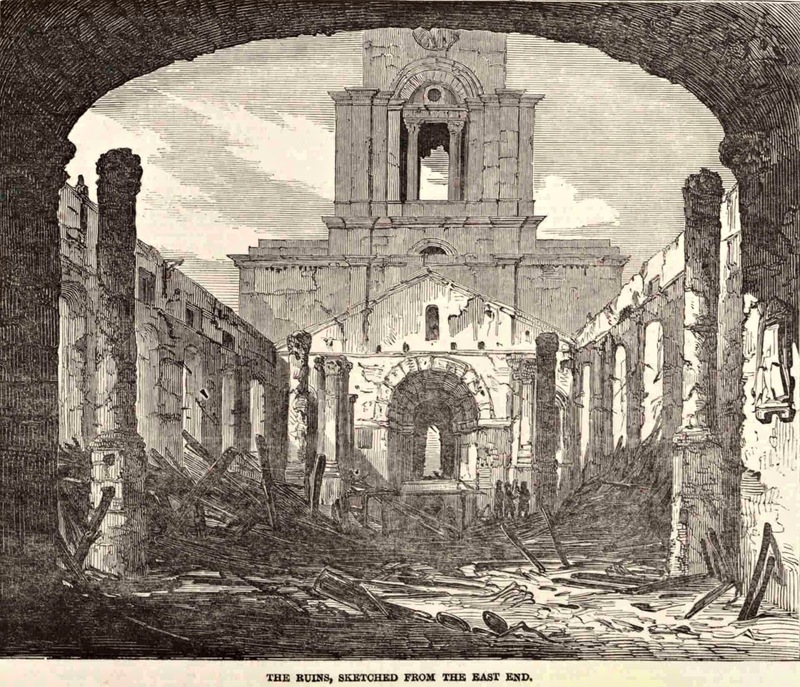 In several places, the iron girders forming the roof have broken through the brick arches on which the floor of the Church rests, and penetrated the vaults. The Illustrated London News mentions one other singular detail which is missing from all the other accounts of the fire that I have read. It mentions, merely in passing, that “while the fire was raging on Friday, a funeral took place in the churchyard.” What an extraordinary picture this presents! 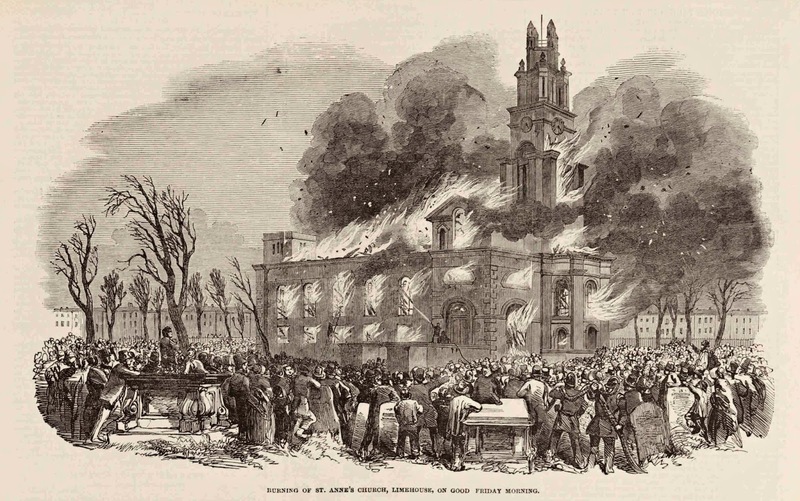 An illustration in the paper shows the building ablaze, the roof collapsed, every window broken, the tower engulfed in flames and thick black smoke billowing up into the March sky. Tiny firemen with ineffective hoses fight futilely to contain the inferno and in the churchyard there is barely a vacant inch of turf as crowds of curious onlookers prop themselves up against headstones or lean over chest tombs as they watch the unfolding mayhem. In the midst of all this someone actually conducted a burial service? Asked people to move out of the way while pall bearers who must have struggled to tear their eyes away from the conflagration somehow manoeuvred a coffin to a freshly dug grave? If there were any relatives didn’t they object to the timing of the service? It seems scarcely credible but it is true. 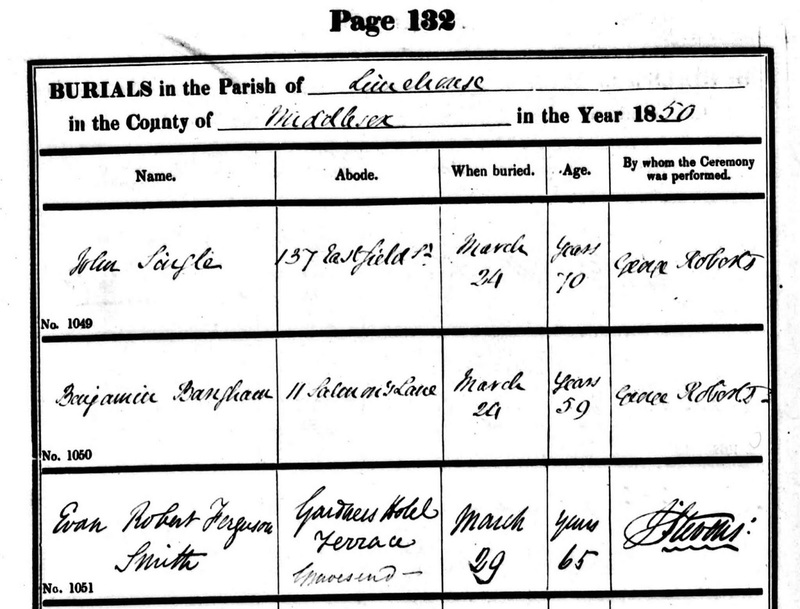 The burial register shows one burial taking place on 29 March 1850. 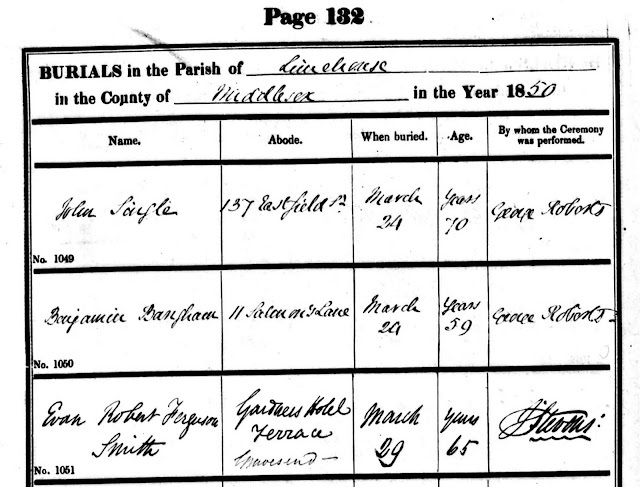 The ceremony was not conducted by the Reverend George Roberts (who had carried out the previous two burials on 24 March) presumably because he was otherwise engaged saving the parish records and the chandelier. The officiating clergyman was Thomas Stevens (“Hey, George old man, did you by any chance manage to save the burial register?” “I certainly did Thomas old fruit, I’m sure its here somewhere.” “Excellent, chuck it here can you, if I don’t bury that old sailor from Gravesend I’m going to have to refund his daughter the ten shillings and I spent it last night at the Prospect of Whitby.”) The deceased was the 65 year old Evan Robert Ferguson Smith who intriguingly had died at Gardner’s Terrace Hotel in Gravesend. I presume he died whilst staying as a guest at James Gardner’s establishment rather than keeling over in the saloon bar as a result of one too many rum and waters and acute cirrhosis. He was probably buried in Limehouse rather than over the other side of the river in Gravesend because he had relative there. The Terrace Hotel still stands today at 46 The Terrace, DA12, though you can no longer drink yourself insensible there or pay to crash out in one of its rooms as it is a private residence nowadays rather than a pub. The ghost of Evan Smith is still sometimes seen loitering in the old tap room trying to cadge a bottle of pale ale.